Recently we went away for the weekend to the rolling hills of Northumberland County, Ontario. We stayed in a beautiful straw-bale home set atop one of these hills with views that stretched for miles. It was a serene and peaceful space in which to recover our equilibrium during a busy time of wedding planning. In the evening we took a stroll down the long gravel driveway bordered by a variety of trees damaged in last month’s ice storm and a newly-constructed split-rail fence. 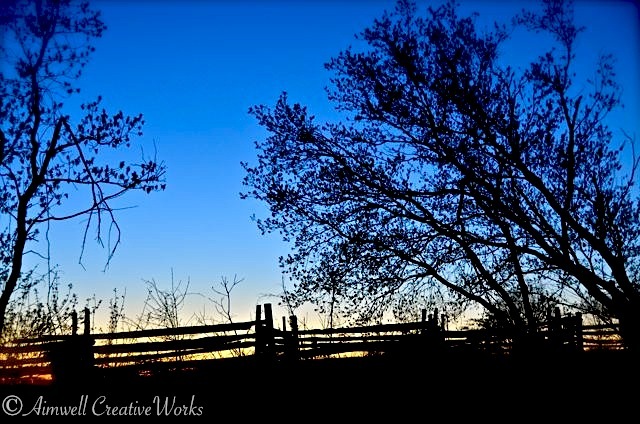 As we stared into a glorious twilight sky I was moved to capture this dramatic silhouette. This entry was posted in Canada, Landscapes, Photography, Uncategorized and tagged landscape, Light and shadow, Ontario, Photography, spring, sunset. Bookmark the permalink.